Stake £5 on Betfred's brand new slot Coyote Moon and yhey will reward you with a free fiver to play this superb title again the following day! As an added incentive, Betfred will be notifying players who take advantage of this great offer with further promotions in the coming days! Featuring a massive 40 paylines as opposed to the regular 25, a lucrative stacked wilds feature and an impressive free spins bonus with the potential for a massive 255 free spins, Coyote Moon is all set to take Betfred Games by storm! Promotion runs from 00:00:01 17/05/2012 until 23:59:59 18/05/2012 (“Promotion Period”). Invitation to the Promotion will be by email or another method at Betfred’s discretion. This offer is only available to players who reside in the United Kingdom and have GBP registered as their currency. To qualify for the free £5 players must stake £5 or more on our new game Coyote Moon. No other games will count towards this promotion. Bonus funds will not count towards the £5 staking requirements. The maximum Promotion prize is £5. Promotion prizes will be added daily from 18/05/2012 until 19/05/2012 based on the previous days staking. The player has three days (3) days to play the bonus from receiving winning email notification, before the bonus amount becomes void. In order to withdraw the bonus and winnings from the bonus, players must stake at least twenty (20) times the bonus amount. Only bets placed via the Games Channel will count towards the wagering requirements to withdraw the bonus funds. Excluded Games are excluded from forming any part of the wagering requirements. Promotion prizes are available only once per person, family, household address, e-mail address, credit card number, alternative payment method and environments where computers are shared (university, society, school, public library, workplace, etc.). In the event that Betfred believes a user is abusing or attempting to abuse a cash prize, competition, bonus or promotion, then Betfred may, at its sole discretion, withhold the cash prize, competition prize bonus or promotion. Betfred reserves the right to withdraw or amend this offer at any time, for any reason and without prior notice. In the event of a dispute, the decision of the Betfred management will be final. 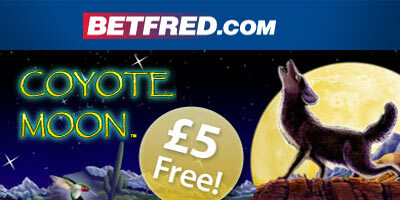 "New Coyote Moon video slot bonus: 5 pound free with Betfred Games"